The Biblical story of the Exodus chronicles the Hebrews' escape from servitude in Egypt, their 40-year sojourn in the wilderness, and their eventual arrival in the Promised Land. The Hebrews had lived peacefully around the Nile Delta for 400 years. 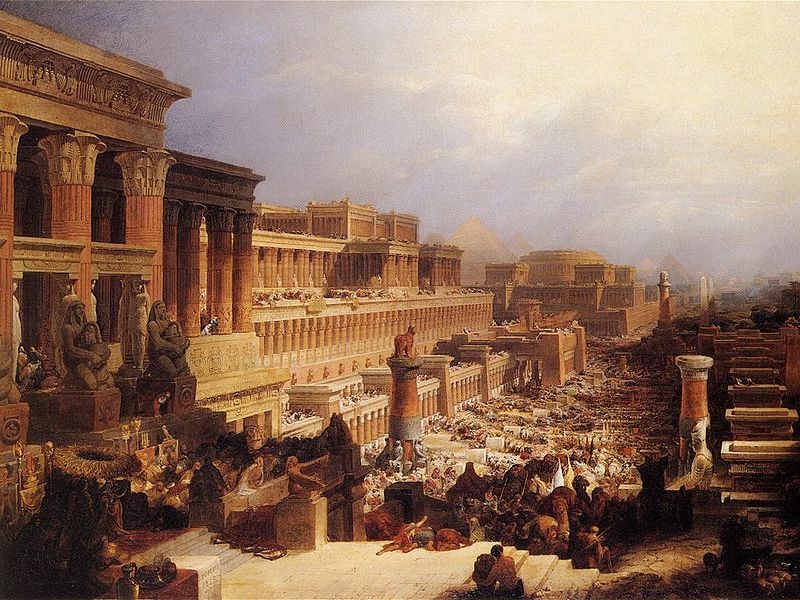 All this changed, however, in the 13th century BC, when Egypt became anxious about their growing numbers. A new pharaoh, now thought to be Seti I, condemned them to hard labour. They were to fare no better under Ramses II, who set them to work on the construction of his temples and the massive new city of Piramesse. According to the Bible, God took pity on the Hebrews and appeared to one of their number, Moses, promising to deliver his people from slavery. Ten times Moses petitioned Pharaoh to free the Hebrews. Ten times the king denied them freedom, and after each denial Egypt suffered a terrible catastrophe. The rivers were said to run with blood, until ‘the fish that was in the river died, and the river stank, and the Egyptians could not drink of the water’. Finally, when all the first-born Egyptian children mysteriously died in the night, Ramses took fright and expelled the Hebrews. But on hearing of their actual flight, he regretted the loss of his work-force, and set out to recapture them. With a vast army, he caught up with the fugitives by the Sea of Reeds (perhaps one of the inland lakes between the Mediterranean and the Gulf of Suez). Heaven-sent help came once more, the waves parting to allow the Hebrews to cross, but closing behind them to engulf their pursuers. Needless to say, none of these events are corroborated by ancient Egyptian records since the Exodus was a minor affair in Egyptian annals. If the Exodus did not occur, then Judaism is a lie. Their law meaningless, and Jesus Christ a lie. So what are we to think? That would make four monotheistic religion lies. Muslims, Judaism, Christian Protestants, and Christian Calthoic.